There are ghastly shapes above our heads. When the nights are dark and cold—ghosts of the night come alive. Ephemeral… tenuous… these night specters are buried at the edge of our perception. These are the things that make you squint and question if you actually see anything at all. But you do see it—the ghosts of the night. Once seen, they can never become unseen. The eternal haunting will be with you into until the day you die, and even then, there’s no guarantee you will rest in peace. These are the ghosts of autumn. Admire with caution. Night specters have been haunting humanity since the birth of time. They mentally scar those that are foolish enough to look at them in the eyes. One of the night specters is known as M31—the Andromeda Galaxy. High above northern heads well after midnight, the Andromeda Galaxy is merely a wisp among a canvas of black. Those that seek out this specter only stand a chance under the darkest of skies. Light easily banishes the soft glow of the Andromeda Galaxy. Once you are able to bask in the shade of night—look up—if you dare. 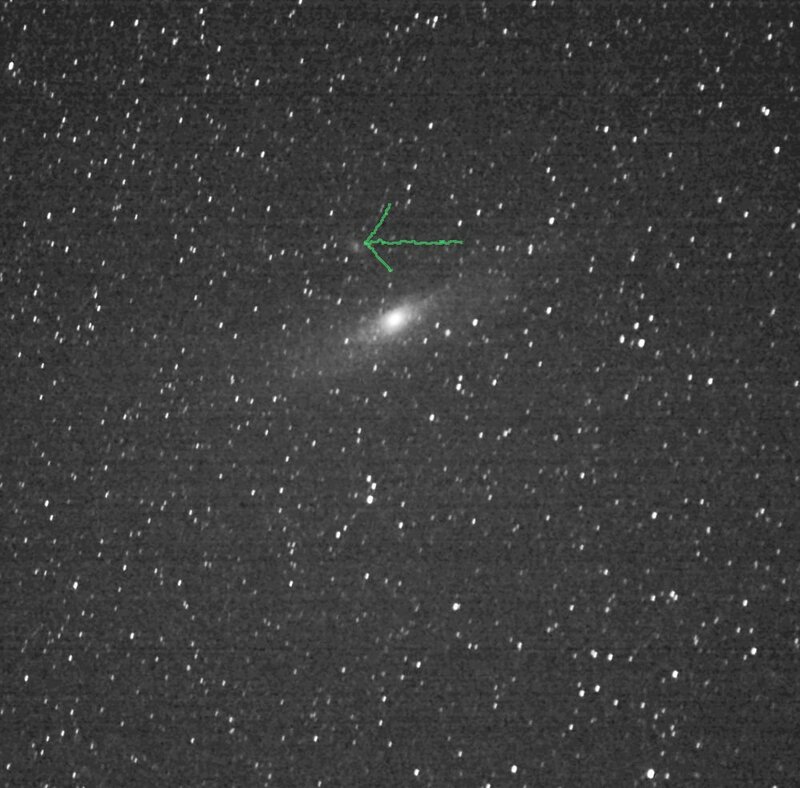 M31 is buried in the constellation Andromeda. To view this specter: locate Cassiopeia—a distinctive autumn constellation for northern dwellers. The shape of the constellation resembles a crooked letter M, lightning bolt, or W. The stars are all relatively bright and are unmistakable. Cassiopeia will be the lighthouse that keeps you steady in the night. Learn to become acquainted with this stellar beauty and she will treat you well. 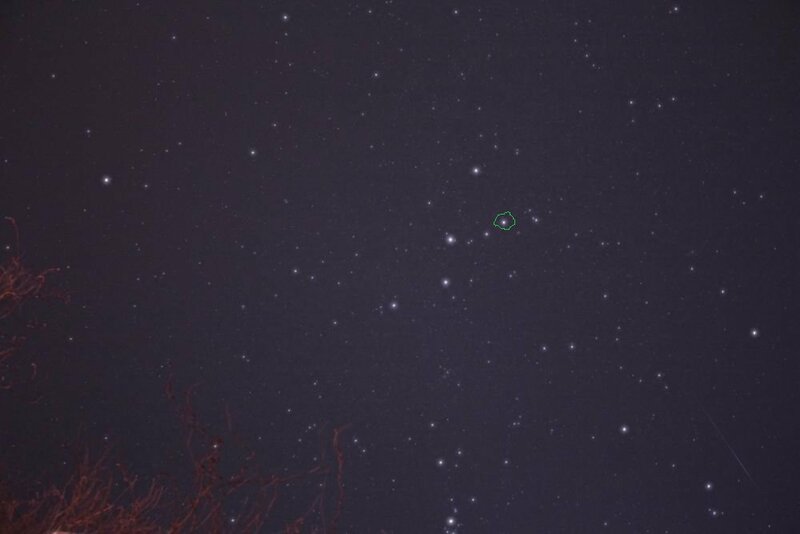 Within the jagged W of Cassiopeia, a star points the way. This stellar gem will close the cosmic gap that separates you from the specters of the night. Once you have acquainted yourself with Cassiopeia, and are confident in your ability to locate this starry queen, it’s time to set your eyes on a specific star. This star will hold your hand in the darkest of nights. Take note of the illusionary green blob. The star imprisoned within the belly of the green blob will point the way toward the specters of the night. Learn the stellar position of Schedar—you’ll be one step closer to being haunted for the rest of your life. Now that you are able to place yourself at the cosmic crossroads—will you be ready to take the journey? Which road will you travel first? Choose wisely. The state of your sanity will heavily depend on your decision. 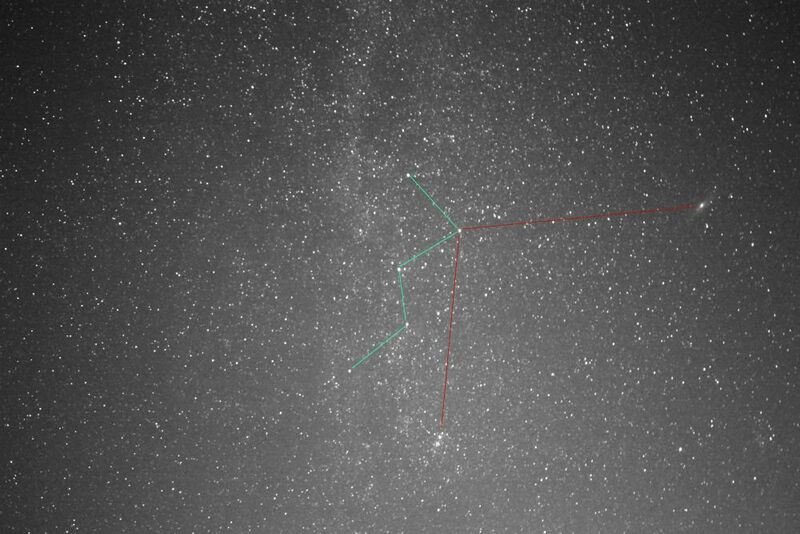 If you decide to travel to the right of Cassiopeia—you’ll eventually see a strange cloud of light. You may not believe anything is there at all, but trust your instincts, you’re not seeing things. Something is there…something that lies at the edge of our visibility. This something is known the Andromeda Galaxy. A fourth magnitude diffuse ghost—you may have difficulty finding it at all. Insure that you hunt under the darkest of skies. Night specters are easily repelled by earthly photons. Andromeda has a secret: it has a twin ghost. You will never be able to see this dim ghost with only your eyes—its existence is only perceptible with the aid of long exposure photography or optics. Look closely at the image above. 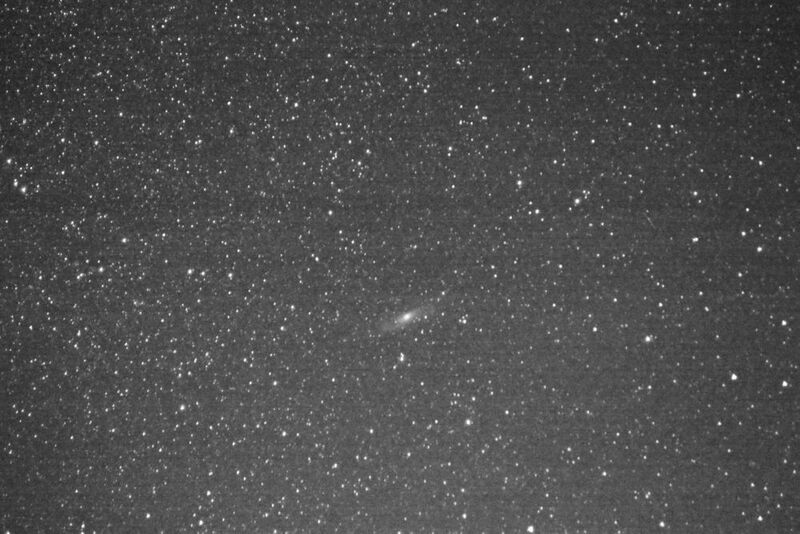 Ignore Andromeda’s hypnotic galactic core. Set your gaze toward the outskirts of the wispy galactic arms. If you dare: commit yourself to a steadfast glimpse in front of the massive green arrow. Eventually something will emerge out of the dark—a slight smudge of light that barely glows brighter than the black of night. Do you see it? Because it sees you. This ghost is known as M32, an elliptical galaxy that is home to uncountable suns and horrors not yet known to humanity. This photographic evidence of a night specter should convince you of their existence. What will happen when Andromeda and the Milky Way coalesce? Why does Andromeda contain so much dark matter? The Andromeda Galaxy is a ghost that can never be unseen. Once you know where to look—you’re haunted for life. If you decide to travel down the other road, you’ll eventually notice a pair of odd lights. These twin ghosts are known as the Double Cluster in the constellation Perseus. These hazy specters are shy and repelled by obnoxious light pollution. Seek the darkest environment your soul can handle. Allow your eyes to stretch open for no less than 25 minutes if you want to stand a chance at seeing these celestial ghosts. As with Andromeda, once you see the Double Cluster—you’ll never be the same again. Only those with a tempered spine and a concrete will are brave enough to aim optics at these sky ghosts. Each glimpse will chip away your sanity. There are reports of people becoming incoherently mad after observing these sky ghosts for long periods of time. 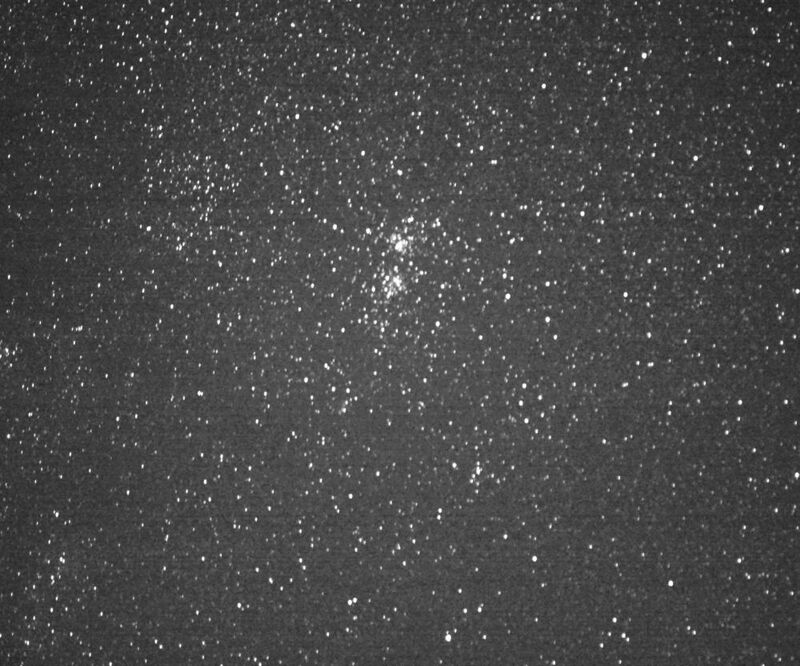 The glimmering lure of the Double Cluster’s shine can never be repelled. A gang of ultra-luminous stars, well over 7,000 light years away, is responsible for the Double Cluster’s ghastly appearance in the sky. 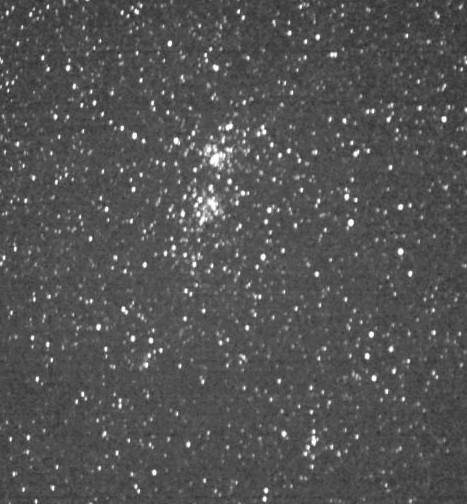 To peer at the Double Cluster means to peer through galactic space. This ghost resides in the Perseus arm of the Milky Way while our solar system is safely tucked away in the Orion arm. Who knows what kind of unnamed horrors live across our galactic backyard. Charles Messier believed that the Double Cluster is peculiar enough not to be confused with a comet. After all, would you confuse two specters in the night as a comet? Charles knew something profound about the Double Cluster. Why else would Charles not include it in his list of comet impersonators? Maybe it’s a subtle warning…what could it possibly mean? I understand if you have trouble finding these ghosts in the sky. My directions are cryptic and may not be enough to guide you along your journey. But that’s fine. If you spend enough time in the dark. Alone. Scared. Paranoid—you’ll eventually see night specters. The only question is: will you be able to look away? You may not believe ghosts exist. Ignorance keeps us safe from the things that we fear to understand. There are many more nights to come, far more than you or I can hope to ever appreciate. You may not see these ghosts tonight. You may not see these ghosts tomorrow night. Or the night after that. Some day, as long as you’re willing to venture into the dark, the specters in the night will come alive. These ancient tactics will help increase your chances of seeing a night specter. Don’t underestimate your night vision. Many people forget that our eyes require time to fully adjust to a particular dark location. Give yourself plenty of time to widen those blackened pits in your eyes. When they become hungry for light—aim them at the sky. Ha — school and I don’t mix very well. It doesn’t have to be in a school, you’re doing a great job of teaching it here.